Also serving communities of Dardenne Prairie. There are 14 Memory Care Facilities in the O Fallon area, with 2 in O Fallon and 12 nearby. The average cost of memory care in O Fallon is $4,872 per month. This is higher than the national median of $4,650. Cheaper nearby regions include Wentzville with an average starting cost of $4,160. To help you with your search, browse the 12 reviews below for memory care facilities in O Fallon. On average, consumers rate memory care in O Fallon 4.0 out of 5 stars. Better rated regions include Chesterfield with an average rating of 4.5 out of 5 stars. Caring.com has helped thousands of families find high-quality senior care. To speak with one of our Family Advisors about memory care options and costs in O Fallon, call (855) 863-8283. Nearly 80,000 people live in O'Fallon, Missouri, a suburban city in western Saint Charles County. Approximately 11 percent of O'Fallon's residents are at least 65 years old. Seniors with conditions such as Alzheimer's disease and dementia have more than 20 memory care facilities available in the O'Fallon area. Memory care facilities in Missouri are called residential care facilities (RCFs) or assisted living facilities. Both require formal training in dementia care. O'Fallon is home to world-class medical facilities, including those specializing in brain health and dementia care such as Progress West Hospital, in the event of medical emergencies or illness. Weather fluctuates throughout the year, with the coldest temperatures in fall and winter and the warmest in spring and summer. Temperatures typically range from the mid 20s to high 90s, but single-digit and triple-digit temperatures may also occur. Seniors prone to wandering away or getting lost should feel safe in O'Fallon, which is safer than nearly 6 out of 10 U.S. cities. The risk of falling victim to violence is approximately six times higher for Missouri as a whole than it is in O'Fallon, and the city averages just one murder per year. The National Council for Home Security and Safety ranks O'Fallon as the third safest city in Missouri, with only Town and Country and Ballwin ranking higher. The cost of living in O'Fallon is higher than the U.S. and Missouri average, but not by much. O'Fallon has a score of 107 compared to 100 for the national average and 93 for the Missouri average. O'Fallon residents pay less than the Missouri average for groceries and utilities, but housing costs exceed the state and national average. Memory Care costs in O Fallon start around $4,872 per month on average, while the nationwide average cost of memory care is $4,799 per month. It’s important to note that memory care rates in O Fallon and the surrounding suburbs can vary widely based on factors such as location, the level of care needed, apartment size and the types of amenities offered at each community. 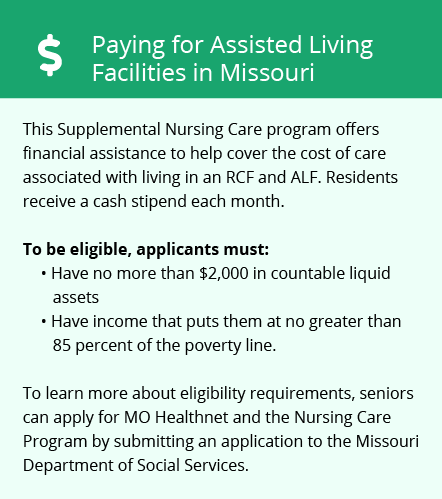 Learn more about these programs, plus who’s eligible, on our Memory Care in Missouri page. For more information about different ways to finance memory care, visit our Memory Care in Missouri page. O Fallon and the surrounding area are home to numerous government agencies and non-profit organizations offering help for seniors searching for or currently residing in an assisted living community. These organizations can also provide assistance in a number of other eldercare services such as geriatric care management, elder law advice, estate planning, finding home care and health and wellness programs. To see a list of free memory care resources in O Fallon, please visit our Assisted Living in Missouri page. 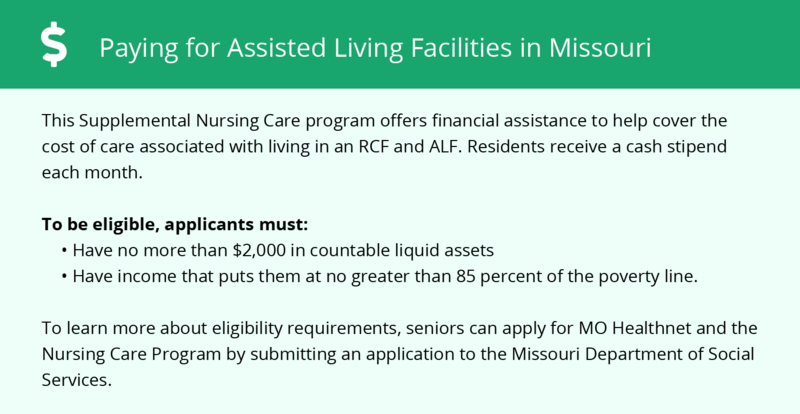 O Fallon-area assisted living communities must adhere to the comprehensive set of state laws and regulations that all assisted living communities in Missouri are required to follow. Visit our Memory Care in Missouri page for more information about these laws.